FREE $10 Target Gift Card When You Spend $50! I'm so happy to see that Target is doing this again...I totally took advantage of this offer last year! 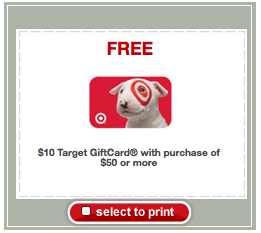 Head over here to print a coupon that will get you a free $10 Target gift card when you spend $50 or more in-store. With holiday shopping, this should be pretty easy to score!